Writing constitutes a big part of my everyday life. I write emails, Slack messages, blog posts, articles, messages to my Mom, notes, research drafts, and whatnot. So it seems there is little to no time to be set aside for writing for my own pleasure. 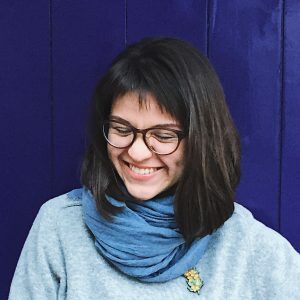 And a new blog post about my travels takes four months to be written. So much for productivity talks. Although I could really write about Amsterdam where I went at the beginning of May. But I will tell you about Lviv instead. The city that stole my heart this June. Now, some of you my foreign friends might be wondering where exactly Lviv is. And why I ended up going there in the first place. Lviv is situated in the Western part of Ukraine, close to the Polish border. It was founded about an eternity ago, back in the 13th century, and has had quite a vivid history since then. At different times, it used to be Ukrainian, Austrian and Polish, until it was occupied by the Soviet Army in 1939. Together with the rest of Ukraine, it became independent in 1991. At the moment, Lviv is one of the main centers of the Ukrainian culture. Its thriving history and unique atmosphere bring tons of tourists every year. Me included. So, after having worked in the company for two years, I finally got to see the folks I chat to every day. Which was exciting, to say the least. So, the six of us arrived to Lviv from St. Petersburg. We had to fly via Minsk, Belarus, as there are no direct flights between Russia and Ukraine at the moment. To avoid any confusions at the border, our Ukrainian colleagues sent us an official invitation that we were supposed to show to the customs officer. Luckily, no one asked us any questions as to why we were flying in to Lviv and what the purpose of our visit was. Before the notorious events of 2014, Russia and Ukraine used to be very close. There are a lot of families that live on both sides of the border. Naturally, there used to be a much better connection between the countries, including transportation. I remember taking a train to my friend’s wedding in Kiev back in 2009. At that time, I could even travel on my internal Russian ID! As of now, the relations between the two countries are somewhat tenuous. But nonetheless, they are much better than the propaganda on both sides wants to make you believe. When I told my parents I was going to Lviv, they were like, ‘Are you sure it’s safe? You are probably going to get picked at, if not worse’. Apparently, it is considered more dangerous to go to the neighbouring Eastern European country that we have so many ties with than to go to Iran or North Korea? Nah, give me a break. I felt perfectly safe in Lviv. I could walk around the town freely, even during the later hours. We spoke Russian among ourselves and to the locals. They would understand everything just fine and reply in Ukrainian, and we would understand like half of what was said, and everyone was happy. If you are a Russian and you haven’t been to Lviv before, the first place the locals are going to take you is going to be Kryivka. It’s located on the Market Square (Ploscha Rynok). To get in is no trivial task: you have to say a slogan in Ukrainian that would prove your intentions. At the entrance, the host asked us to say a slogan in Ukrainian. We decided to keep quiet and left the talking to our Ukrainian colleague. Apparently, the host was happy with the decision, as he thought we were Polish and let us in. Inside, you can savour Ukrainian and Polish cuisine, have a drink and measure how Russian you are. That is, you can put on a helmet, and supposedly, it’s going to tell you how much of a “Moscal” (an offensive name of a Russian) you are. If you are after some super touristy experience, this is a must visit. Don’t let the name of this “attraction” deceit you: the High Castle is neither high nor a castle. Located on a hill close to the city center, it used to have a castle at some point. At the moment, it is a viewpoint from which one can observe the whole city. I can’t give any recommendations whether the views are great or not: by the time we got up here, it was midnight. But apparently, during the summertime, the viewpoint is also a party place for the youngsters. So if you are looking for a company to share a beer with, I would definitely recommend. Lviv’s charming Old Town resembles old Krakow or Prague and is about a moon away style wise from other Soviet-style Ukrainian cities of the East. Its cobbled streets and Vienna-like coffee houses will make for a great lazy afternoon stroll. 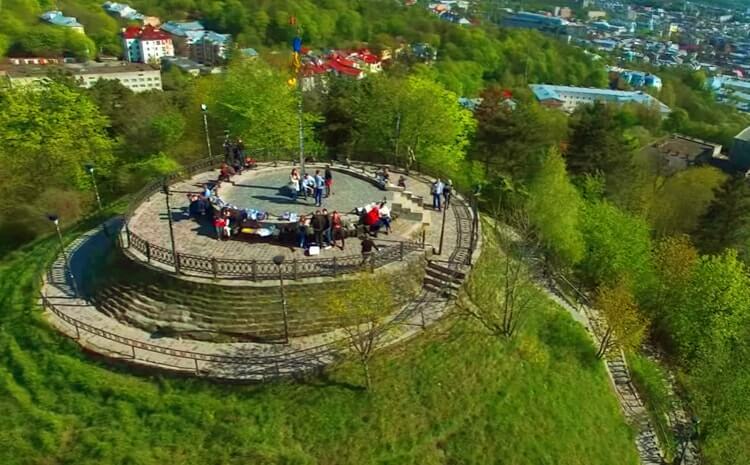 Start exploring the city from the Ploscha Rynok, climb the top of Ratusha and continue your day at one of the restaurants on the Kryva Lypa (Crooked Linden) street. You won’t be disappointed. If you are after some cathedrals, Lviv got you covered, too. The Dominican Cathedral, St. George Cathedral and the Assumption Church are among my favorites. When you get tired of earthly pleasures, head over to the Lychakivsky Cemetery for a quiet and peaceful walk among some prominent men of the past epochs, including Ivan Franko, perhaps the most famous Ukrainian poet. 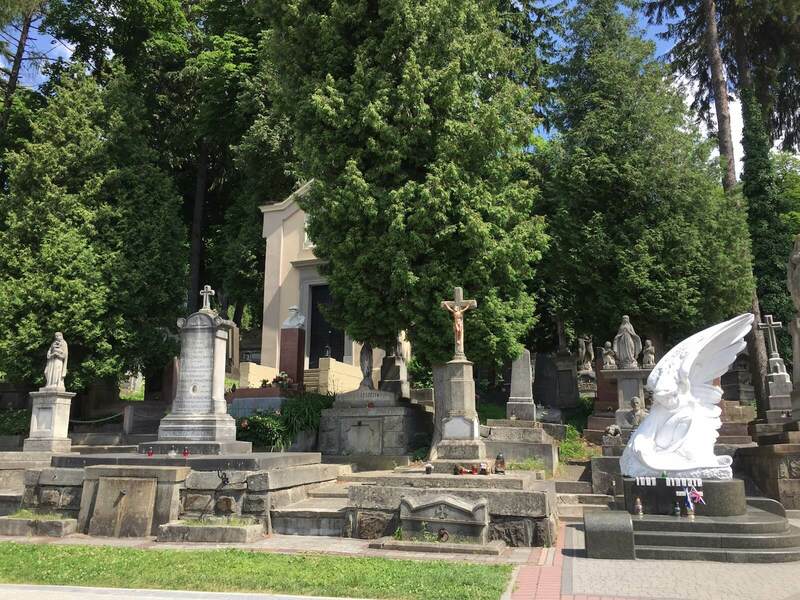 As Lonely Planet fairly noted, “This is the Père Lachaise of Eastern Europe”. You will have to pay for the entrance but the price is quite reasonable and definitely worth the Gothic aura of the cemetery. My story about Lviv wouldn’t be complete without mentioning all the great bars we visited during our stay. In fact, they were so many, I had to summon my colleagues for help. God bless private channels on Slack! Lviv has quite a thriving beer culture. 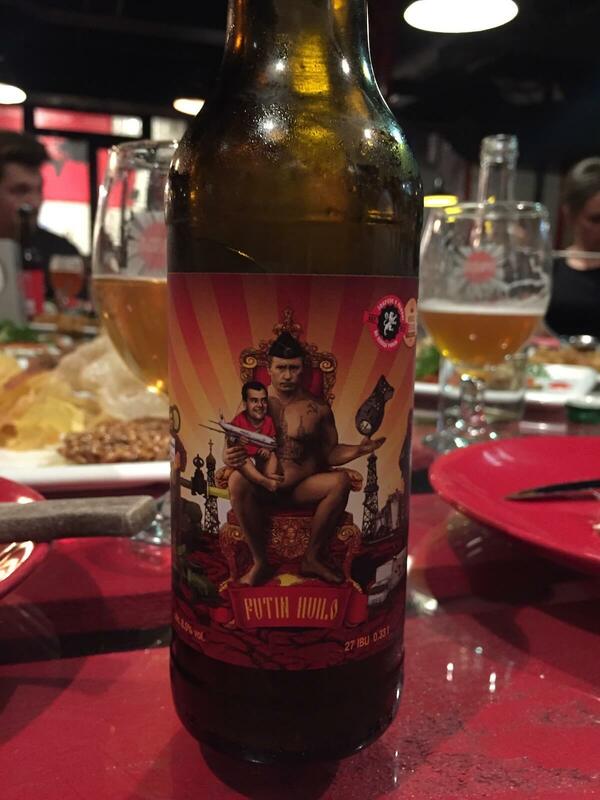 In many places, you will get great craft beer from all over Ukraine as well as some local specialties. 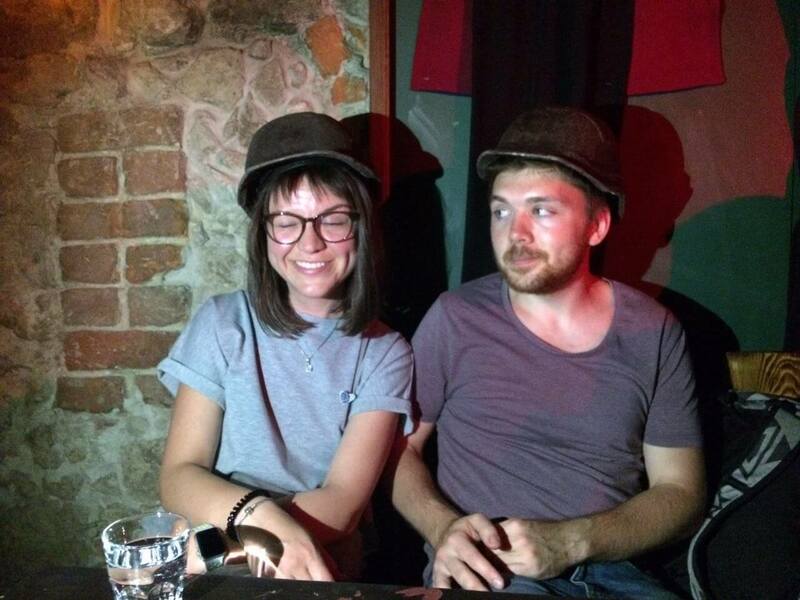 Here is my list of must visit bars in Lviv. 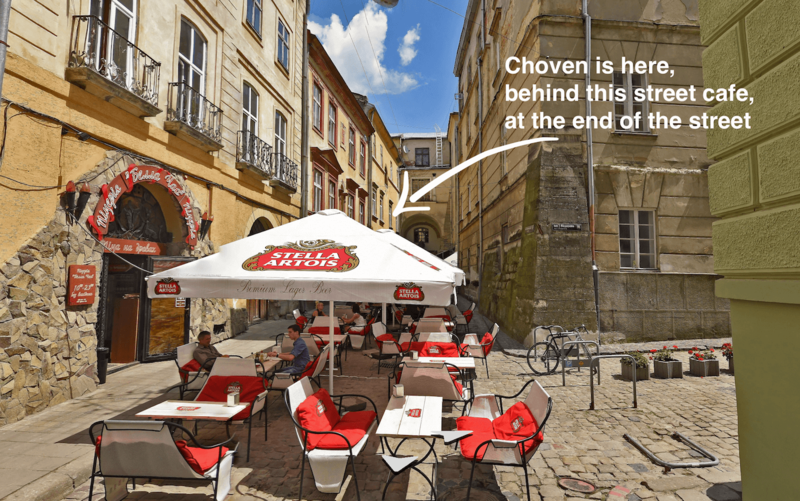 Translated into English as “boat” or “arc”, the Choven bar was the very first one of our 4-day beer adventure in Lviv. And for good reason. It offers a great variety of craft beer, IPAs, ales and stouts included. The food was also great. It’s located on the picturesque Armenian street but might be a bit tricky to find. Look for the archway at the end of the street, Choven will be on the left-hand side. The name of this place speaks for itself: it is indeed a whole theater but with beer. The bar is gigantic; it was big enough to host like 30 of us. It offers a great variety of food and all kinds of beer, both on draft and bottled. Some sorts are quite peculiar, like this one that can be translated to something like “Putin is a douchebag”, to put it mildly. Located in a remote neighborhood on the territory of what used to be a factory, Ganok is now an open-air dancing place. A perfect party spot for a Friday night. A small hip bar located on the Kriva Lipa passage. It offers quite a variety of craft beers and a very interesting toilet decoration. During the summertime, it’s great to grab a beer and enjoy it in the street. I could go on and on about how wonderful Lviv is in summer. But you should just go and see for yourself. Chances are, it’s going to be your new big love.